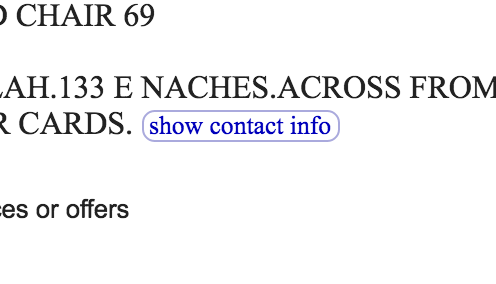 When you click on the button, Craigslist makes an XHR request that fetches the entire body of the post, including the phone number, and replaces the existing body with the newly fetched body. How is this more secure? If I'm writing a scraper, all I have to know is the post ID and the URL format of that XHR request and I can get the phone number. So what makes this more secure? As a side question, is there a better way to protect user phone numbers? I'm creating a product where user phone numbers will be publicly accessible (as they are on Craigslist) and I want to protect them as much as possible. This is not necessarily directly a security measure. I don't know why this design was made, but I do see an obvious advantage to hiding sensitive information behind an extra click: a non-malicious scraper — such as a search engine — won't include it. So when the listing is gone, so is the private information. If the information was easy to scrape, it could linger for a long time on Google's cache, or even forever on the Web Archive. That type of approach does drastically reduce the scraping because it makes it much more complex to do. Note that there is no ideal way to block it completely since they want the information to be available to the other users. With OCR systems, even placing it as an image is still far from perfect. Not the answer you're looking for? Browse other questions tagged web-application phone or ask your own question. Has there been any documented cases where hackers have hijacked the phone number to a business? What information can be gained given only a phone number? Providing phone number safe or not?